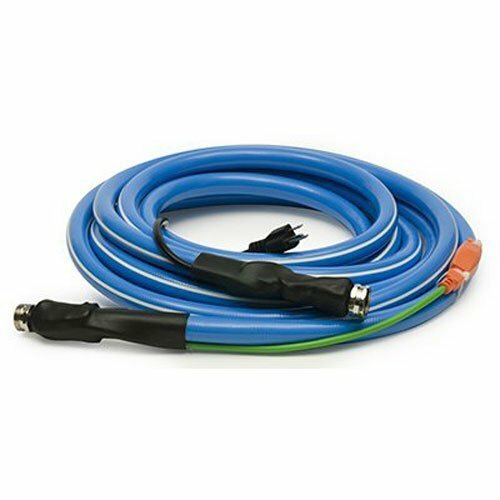 Cold weather water hose ideal for normal farm and garden use, and light commercial applications. Ideal for tasks requiring running water in below freezing temperatures. Thermostatically controlled to activate automatically when temperatures are below 45 deg (degrees) F (Fahrenheit) and turn off when temperatures are above 50 deg F. Tested down to -42 deg F. Features a grounded power supply, grounded nickel plated brass female & male couplings, protective bend restrictors at both ends, abrasion resistant cover, and knit reinforcing. Heater wires are extruded directly into the hose walls for uniform heating and unrestricted water flow. Made with FDA (Food and Drug Administration) approved materials. Drinking water safe. UL (Underwriter's Laboratories) listed. MET approved. 1-year limited warranty. The Product is manufactured in China. If you have any questions about this product by Pirit, contact us by completing and submitting the form below. If you are looking for a specif part number, please include it with your message.